Wucai porcelain wine cup/tea bowl, decorated in underglaze blue. They say its imari japanese Imari bowl from the Edo period, around 1780-1810. Allan, could be. Whould be interested to know if this is confirmed. 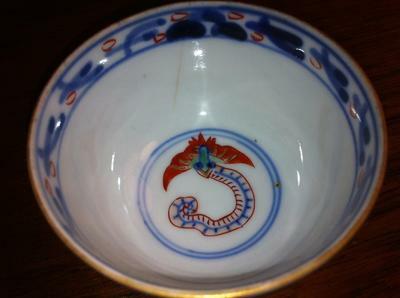 The mark is a bit unusual for Japanese porcelain. Usually, they seem to have preferred other Ming marks. It is the lighting again. The blue does not look like it should. Better take pictures during the day, near a window. Authentic wucai items are not easy to find. There are scores of fakes and the Japanese did also make them with Chinese motifs. The only wucai cups from the late Qing dynasty (also with Wanli mark) I have are painted with more detail. I wouldn't buy this as crude painting is sometimes pointing to fakes. Again, if this were Qing dynasty, then this blue tone is wrong. I got the feeling I have seen this decoration on the Japanese Internet, where they sell a lot of fakes.